The destruction at a 1,400 year old cemetary in East Jerusalem on Wednesday, reportedly to clear space for a national park, sparked condemnation among Palestinians. In a video posted to social media by the Jerusalem Media Center, a Palestinian non-governmental organization, personnel from the Israeli Nature Authority are seen destroying the graves at Bab Al-Rahmeh ("Gate of Mercy") Cemetery, as members of the Israeli Defense Force look on. The area is reportedly being transformed into a national park, the International Business Times reports. “Personnel from the so-called ‘Israeli Nature Authority’ – backed by large numbers of Israeli forces – stormed the historical Bab Al-Rahmeh cemetery and knocked down eight graves,” Mustafa Abu Zahra, the head of the Committee for the Preservation of Islamic Cemeteries in Jerusalem, told Turkey’s Anadolu Agency. The cemetery is located by the Al-Aqsa Mosque, Islam’s third-holiest site, which has been part of an ongoing dispute over the area it is located in. 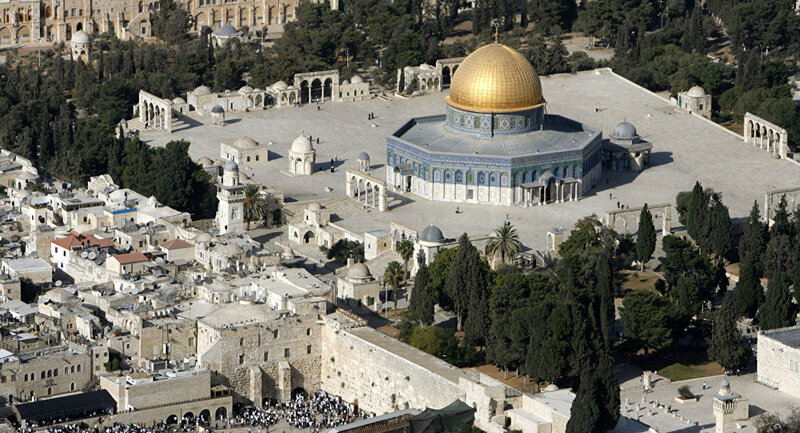 The area is known in Judaism as The Temple Mount, that religion’s holiest site — and known to Muslims as The Noble Sanctuary. Palestinians leaders have claimed that the demolition of the graves is retaliation over the United Nation's world heritage foundation, UNESCO’s, controversial decision on the location. Israel has accused UNESCO of denying Jewish people’s connection to the site. “Last September, Israeli authorities confiscated part of the Bab Al-Rahmeh cemetery, prompting Al-Aqsa Mosque Director Sheikh Omar al-Kiswani to state, ‘not only does the Israeli occupation go after living Muslims, but even the dead are not safe,’" the IB Times reports.